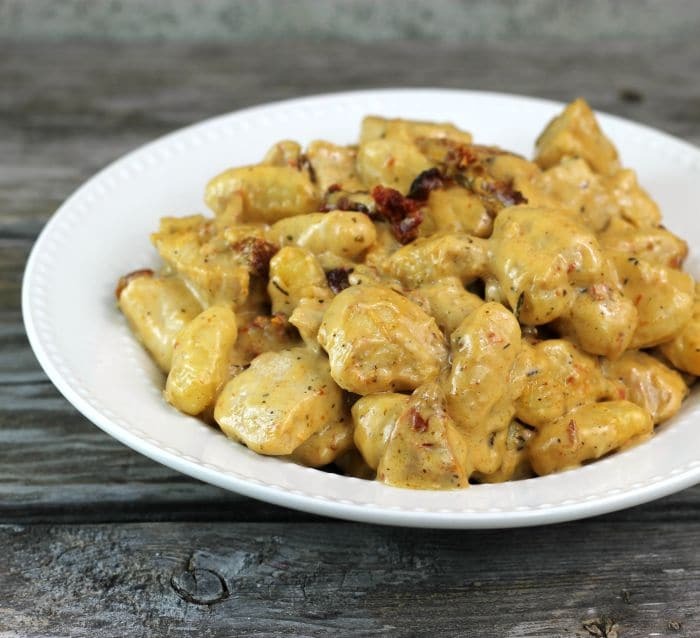 Creamy sun-dried tomato chicken gnocchi, tender bites of chicken in a creamy sauce with heavy cream, chicken broth, and white wine flavored with sun-dried tomatoes, garlic, Italian seasoning, and Parmesan cheese. We have been hit with a stretch of cold weather here in the upper midwest. There have been a few days that I don’t think we got above zero. Brrr… On these days I like to make something that is hearty and warm us up no matter how cold the weather becomes. It wasn’t until recently that I started eating gnocchi. Not only is this delicious to eat it is also fun to say. Mike was actually the one that said to me that I should make something with gnocchi since we both love the stuff. My niece got married this past summer and for the dinner at the reception, the bride and groom had three different serving stations for food. One of the stations had French food, the other serving station had food from the state where the bride and groom are from, and then there was an Italian station. The Italian station had a dish with gnocchi. I think Mike has had gnocchi on his mind ever since their wedding. Fun stuff! This dish is one of those hearty and sticks to your ribs kind of meals. It is simple to make and it comes together quickly. The garlic, sun-dried tomatoes along with the white wine, Parmesan cheese, and Italian seasoning will make your taste buds extra happy. Hows the weather at your neck of the woods? 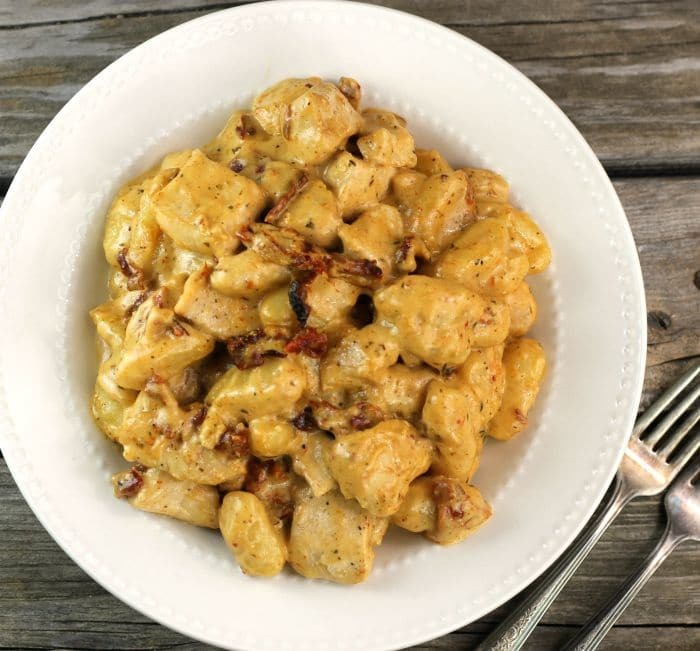 If you are looking for a hearty tasty dish may I suggest creamy sun-dried tomato chicken gnocchi? Cook the gnocchi according to the directions on the package. Drain and set aside. This can be done while the chicken and sauce are being prepared. In a large skillet add two tablespoons of olive oil over medium heat. Season the chicken that has been cut into bite-size pieces with salt and pepper (to taste). Add the chicken to the skillet. Cut for 8 to 10 minute or until it is no longer pink inside. Once the chicken is cooked through remove from the skillet. Add the two tablespoons of butter and melt. To this add, the garlic and sun-dried tomatoes cook for a minute or two. Add the flour and stir until the flour is blended into the garlic and tomatoes. Slowly add the heavy cream stirring constantly. Followed by adding the chicken broth and wine.Stir in the Parmesan cheese and Italian seasoning. The sauce should be slightly thickened at this point. If you prefer not to use wine you can use 1 cup of chicken broth instead. This looks really great! Those chicken chunks are so succulent and tender…a wonderful meal, Dawn. This looks and sounds delicious, Dawn! It’s the kind of stick to your ribs meal we need now, perfect for today after snow-blowing the driveway! Thanks! Yum, yum, holy friggin, YUM!!! 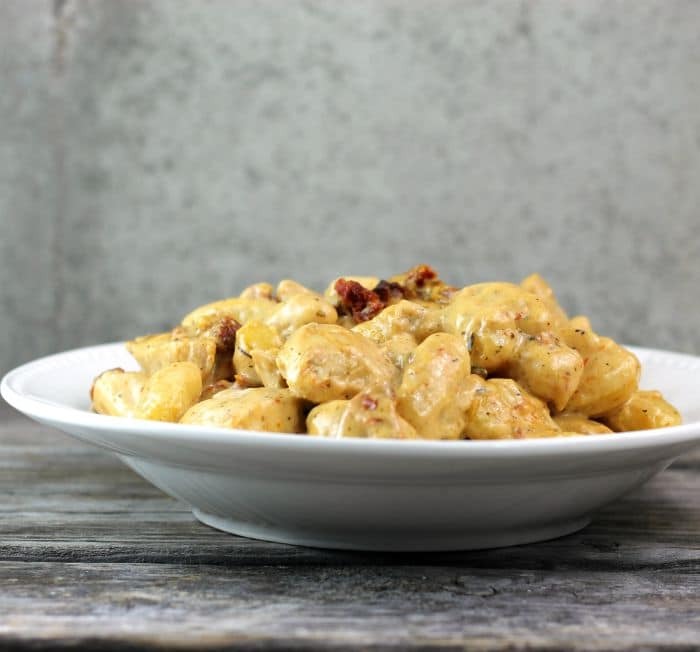 I love gnocchi and sun-dried tomatoes so this recipe is right up my alley! It looks incredible! Yup, cold here today. A bit warmer than where you are, but just a bit. Anyway, love gnocchi! This is such a neat recipe — thanks. It is fun to say, fun to eat, fun to make. Really a win, win all about. pretty outside. I’ll take it. This is the ultimate comfort food! It’s been super cold here too and this would be super welcome at my table! I don’t use sun-dried tomatoes enough – they are so delicious. 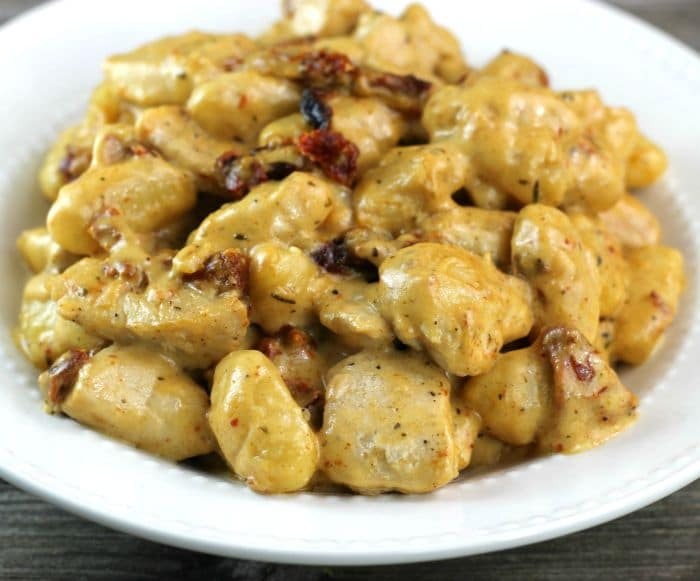 Love that you are eating more gnocchi – it’s one of my favorite too. This frigid weather calls for comfort food! And your creamy gnocchi is DELICIOUS comfort food!!! I love everything about it!! !